Deluxe Ocean Bluff House. Beautiful three bedroom waterfront home perfectly situated on the ocean bluff with amazing views of the Atlantic Ocean. This home is on the ocean side of Truro nestled in the Cape Cod National Seashore where you will experience the natural beauty of ocean, beach and dunes right from your home. You have direct access to the beach below with beach stairs. The ocean beach in front of your home is spectacular. Enjoy lounging on the beach or taking long beach walks experiencing the best that Truro has to offer. This fully renovated home with an open floor plan has many amenities including central air conditioning and linen service is included. Enjoy beautiful ocean views from the dining, living and kitchen areas. The home has nice comfortable furnishings throughout. The living area is open and spacious with comfortable seating and flat screen 48 inch TV. Sonos home stereo system. The dining area just off the kitchen is bright and cheery with oversized windows facing the ocean and dunes. The kitchen has nice natural lighting and is well equipped with upscale appliances and wine cooler. From the great room you can directly access the wrap around deck facing the ocean from the slider in the dining area. The wrap around deck on the main level has ample comfortable seating with panoramic views of the ocean and dunes. Marine life can be seen from the home with seals, dolphins and whales spotted offshore. The home features a roof deck with outdoor furniture for relaxing and lounging. The roof deck has breathtaking views with full sun exposure. In the evening star gaze or catch shooting stars. There are three spacious and nicely appointed bedrooms along with three modern full baths. The master bedroom with a king bed with ocean view is bright and spacious with a slider openning onto the wrap around deck. The master bedroom has a deluxe ensuite bathroom with luxurious oversized shower and dual vanities. Bedroom two with flat screen TV has a queen bed with ocean view and slider opening to the wrap around deck. Bedroom three downstairs with two twin beds. Bathroom two upstairs with shower/tub combination. Bathroom three downstairs with shower. The home is perfect for six occupants; but there is a sleeper sofa in the living room for your extra guests. Dual outdoor rinsing showers with hot and cold water on the lower level. Weber Genesis II Gas Grill. Garage not for cars or motorized vehicles or watercraft; only for storage of bicycles, golf equipment, surf boards, windsurfers, etc. The home is located very close to Highland Golf Links at Highland Light. The home has basic Direct TV satellite programming and wireless internet with DSL connection. 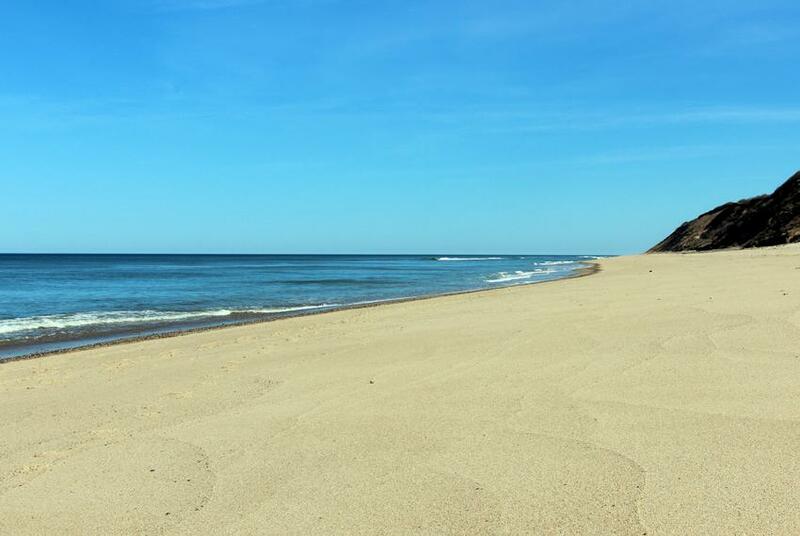 Enjoy the natural beauty of the Cape Cod National Seashore right from your deluxe waterfront home. Last Available Summer of 2019 Weeks. Beginning on Sunday: 8/18, May - June & September - October weeks. $1,500 Security Deposit, $50 Booking Fee & 12.45% State & Local Short Term Rental Tax.